Remarkable Vaugondy map of North America showing speculative Chinese colony of Fusang and De Fonte's mythical voyages. Amerique Septentrionale dressee sur les Relations les puls modernes des Voyageurs et Naviageurs, et divisee suivant les differentes possessions des Europeens. 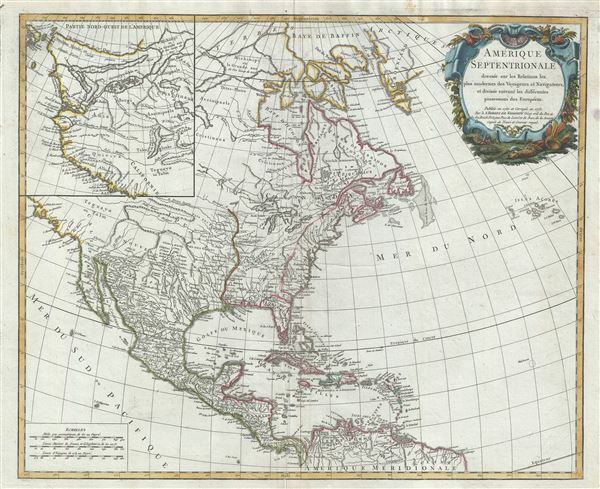 An attractive example of Robert De Vaugondy's 1775 map of North America. The map covers from the high arctic and Baffin Bay south to the northern coast of South America. In includes all of modern day Canada, the United States, Mexico, the West Indies, and Central America. Vaugondy has here updated his original map to reflect the outcome of the French and Indian War. The original English Colonies are identified along the Atlantic seaboard with the newly acquired French territories, also now English, extending from the Appalachians to the Mississippi River and including all five of the Great Lakes. Spain controls all of the former French territory west of the Mississippi River. Florida, also under English control, appears as a separate territory. One anomaly here is that the former French Louisiana east of the Mississippi extending to the ocean in the vicinity to maintain a coastline between the Savannah River and St. Augustine. One might interpret this as Vaugondy looking forward to an eventual French reacquisition of this region and the hope for a valuable Atlantic port for French merchants. This map was first issued in 1750 and exists in five known states, the present example, 1775, being the fourth state, notably issued just one year prior to the outbreak of the American Revolutionary War. Vaugondy's mapping of the Pacific Northwest, appearing in an inset in the upper left quadrant, is particularly arresting. Speculative mapping of the Pacific Northwest based upon sketchy reports of little known mariners seems to have been a particular hobby of Vaugondy. Such is readily apparent in this maps' presentation of this region. The map attempts to combine the speculative cartography of De Fonte, de Fuca, and Cluny, with highly questionably early 18th century reports by the likes of the Baron de la Lahonton and the nefarious conman Penalosa. Focusing fist on the odd network of lakes, inland seas, and rivers lying between the Hudson Bay and the Straits of Anian, we can see a legacy representation of the apocryphal De Fonte Discoveries. The De Fonte legend first appeared in a 1706 English publication entitled Memoirs of the Curious. This short-lived magazine published a previously unknown account by a supposed Spanish Admiral named Bartholomew de Fonte. De Fonte is said to have sailed up the Pacific coast of North America in 1640. On this voyage he apparently discovered a series of gigantic lakes, bays, and rivers heading eastward from the Pacific towards Hudson Bay. The De Fonte story relates how, on one of these great inland lakes, he met with a westward bound ship from Boston that must have come through the Northwest Passage. Today, based upon inaccuracies and falsities, we know the entire De Fonte article to have been a fabrication, and nevertheless, it set 18th century Europe afire with speculation that a Northwest Passage must indeed exist. Even such luminaries as Benjamin Franklin wrote long defenses of De Fonte. De Fonte voyage appears here in form of including passages communicating the Pacific with Lac Velasco, thence via a river connection to the high Arctic, as well as another ship's route passing through the Bering Strait and then heading eastwards toward Baffin Bay. This refers to the travels of Pedro de Bernarda, a sub-Captain under Admiral De Fonte. According to the legend, on the 22nd of June, De Fonte dispatched Bernarda northwards where he discovered a large lake full of islands, which he named 'Velasco' after the Governor of New Spain. He then traveled through the Bering Strait and sailed eastward almost as far as Baffin Bay. Like De Fonte, Bernarda was most likely fictional but his explorations were nonetheless used by Captain James Ross in his 1835 argument for a possible Northwest Passage. Further north, in the high Arctic, skirting the proto-Alaskan northern coastline, the route another mythic navigator, an English mariner named Captain Cluny, is identified. Captain Cluny was a mythical Sea Captain, who was thought to have sailed to 82.5 Degrees North Latitude in 1769, information passed on by 'an American Traveler,' shortly before his death in 1770. Vaugondy is one of the few cartographers to embrace the cartography of Cluny and actual add it to his published maps. Another interesting river system extends inland from the Strait of Juan de Fuca becoming the 'Riviere de L'Ouest' (naturally assumed by most to be some sort of proto-representation of the as yet undiscovered Columbia River) before meeting up with Lake Tahuglaucks and thus the conjectural discoveries of Lahonton. Unlike De Fonte, many of De Fuca's discoveries, as well as the man himself, ring of truth. The Strait of Juan de Fuca exists and, though it was named much later, roughly corresponds to De Fuca's actual descriptions. Cook notes sailing past the entrance described by De Fuca but did not explore the strait further. Had he done so he would have found himself in the Puget Sound region later explored by George Vancouver and Amiel Weeks Wilkes. Vaugondy speculatively linkes the Strait of Juan de Fuca with Lahonton's discoveries. Baron Louis Armand de Lahonton (1666-1715) was a French military officer commanding the fort of St. Joseph, near modern day Port Huron, Michigan. Abandoning his post to live and travel with local Chippewa tribes, Lahonton claims to have explored much of the Upper Mississippi Valley and even discovered a heretofore unknown river, which he dubbed the Longue River, here presented running westward of the Mississippi from a point south of the Missouri. This river he claims to have followed a good distance from its convergence with the Mississippi. Beyond the point where he himself traveled, Lahonton wrote of further lands along the river described by his American Indian guides. These include a great saline lake or sea at the base of a mountain range. This range, he reported, could be easily crossed, from which further rivers would lead to the mysterious lands of the Mozeemleck and Tahuglaucks, and presumably the Pacific. Lahonton's work has been both dismissed as fancy and defended speculation by various scholars. Could Lahonton have been describing indigenous reports of the Great Salt Lake? Could this be a description of the Missouri and Columbia Rivers? What river was he actually on? Perhaps we will never know. What we do know is that on his return to Europe, Lahonton published an enormously popular book describing his travels. Lahonton's book inspired many important cartographers of his day, Sennex, Vaugondy, Moll, Delisle, Popple, Sanson, and Chatelain to name just a few, to include on their maps both the Longue River and the saline sea beyond. The concept of an inland river passage to the Pacific fired the imagination of the French and English, who were aggressively searching for just such a route. Unlike the Spanish, with easy access to the Pacific through the narrow isthmus of Mexico and the port of Acapulco, the French and English had no easy route by which to offer their furs and other commodities to the affluent markets of Asia. A passage such as Lahonton suggested was just what was needed and wishful thinking more than any factual exploration fuelled the inclusion of Lahonton's speculations on so many maps. Just south of the Strait of Anian, Vaugondy includes 'Fou-Sang' which he describes as a Chinese Colony. Fusang of Fousang is a region first documented by the Chinese Buddhist missionary Hui Shen in the 5th century. Hui Shen describes a land some 20,000 Chinese Li (c. 8000 km) east of the China coast. Fousang is described in considerable detail in the 7th century Book of Liang by Yao Silian. There are also accounts that the land was settled c. 220 BC by a Chinese Emperor of the Han Dynasty. In later days Fusang was commonly used in Chinese poetry to designate Japan, however earlier references keep it distinct. In any case, Hui Shen's description of Fusang with regard to distance and geography, corresponds more with the coastlands of North America than with Japan. The French historian Joseph de Guignes in his 1761 article 'Le Fou-Sang des Chinois est-il l'Amerique? ' promoted this idea. Cartographers of the era, including Vaugondy, embraced the idea and it was included in many subsequent maps of the region. This map also contains a number of other curious elements, including a maelstrom situated in the middle of the Atlantic Ocean. This curious whirlpool is most likely borrowed from the cartography of Delisle, who is the only other cartographer we are aware of to include it on his maps. Nevertheless, Delisle is unlikely to have imagined it and no doubt drew it from actual mariner's reports. Interestingly modern scientists have recently identified two massive whirlpools in the South Atlantic. While not permanent these whirlpools are known last several months before dissipating. One can only wonder if Delisle discovered 18th century record of this recently rediscovered phenomenon? This map was issued for multiple editions of Vaugondy's Atlas Universal. Guillaume-Nicolas Delahaye (1725 - 1802) was the most prolific member of the Delahaye (De-La-Haye) family of engravers active in Paris throughout the 18th century. Given that the name, Delahaye literally translates to 'of the Hague' it can be assume they were French Huguenots who were forced to flee the Netherlands under threat of religious persecution. He was the son of patriarch Jean Baptiste Delahaye and brother to Jean Baptistie Henri Delahaye. The Delahaye family engraved for many of the great cartographers of 18th century Paris, including Jean-Baptiste Bourguignon d'Anville, Didier Robert de Vaugondy, Jean-Baptiste de Mannevillette, and Jean-Nicolas Buache, among others. He was awarded the public office Premier Graveur du Roi and worked on a series of maps illustrating the king's hunts around Versailles. Guillaume also worked with foreign cartographers such as Tomas Lopez of Madrid. Possibly Delahaye's most significant map is A Map of the Country between Albemarle Sound and Lake Erie prepared for the memories of Thomas Jefferson. He married in 1758. Delahaye died in Charenton and was succeeded by his daughter, E. Haussard. In 1792, another daughter, Antoinette Marie Delahaye (1773-1857), married the geographer Jean-Denis Barbie du Bocage. Very good. Minor marginal discolorations not intruding upon printed map. Original platemark visible. Blank on verso. OCLC: 309401533. Pedley, Mary Sponberg Belle et Utile: The Work of the Robert de Vaugondy Family of Mapmakers, 13.